On the equinox, the path of the tip of a sundial shadow is a straight line. Monumental sundials are sometimes positioned such that this line points to key landscape features–in the Augustus Sundial in Rome (previous post here), the obelisk-gnomon was positioned so that on the equinox this line intersected Augustus’s mausoleum. The Long Island City Sundial is positioned such that this equinox line intersects the United Nations, across the river in Manhattan, at about 8:00am. 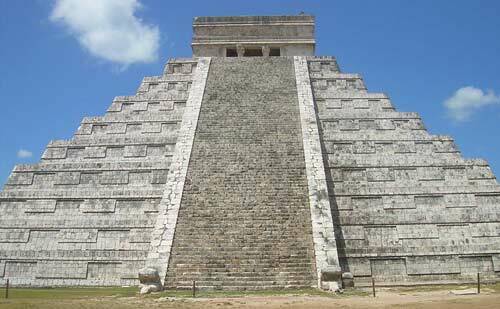 “The Castle” is a step-pyramid in the center of the Chichen Itza archaeological site in Yucatan, Mexico. During the equinoxes at about 3 P.M. sunlight bathes the western balustrade of the pyramid’s main stairway. This causes seven isosceles triangles to form imitating the body of a serpent 37 yards long that creeps downwards until it joins the huge serpent’s head carved in stone at the bottom of the North stairway. This has been called “the symbolic descent of Kukulcan” (the feathered serpent), and it is believed it could have been connected with agricultural rituals. Check here for a 360-degree view from the top of the pyramid. Loughcrew in one of many examples of very, very old structures that are built to align with sunrise or sunset of the solstices or equinoxes during the year. At dawn on the equinox (which this year is on Sept 23) the sun shines through a passageway under the cairn-mound and onto an intricately carved back stone.